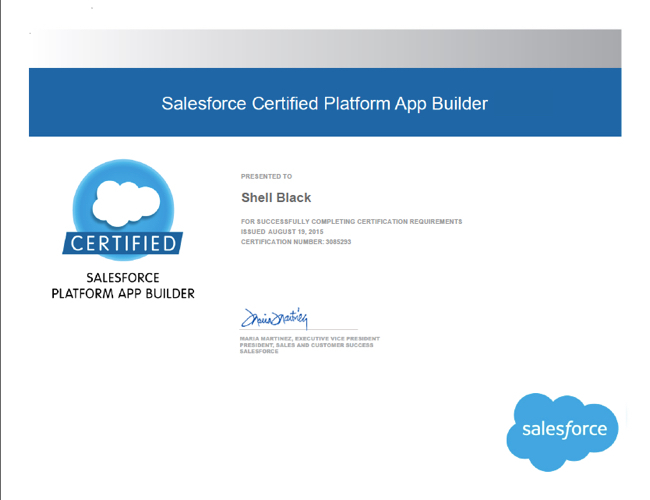 On June 18th, 2015 Salesforce sent an email to existing Salesforce Certified Developers letting them know that a beta program was being put together for a new certification – Salesforce Certified App Builder. Just as the Salesforce Consultant certification morphed into two new certifications back in 2011 (Sales Could Consultant and Service Cloud Consultant), the Developer track was being split into a declarative "button click" App Builder certification and a true programmatic "coder" track with two new certifications supporting that path: Salesforce Certified Platform Developer I and Salesforce Certified Platform Developer II. In that email, to help with the confusion, Salesforce published an App Builder Certification FAQ. On August 12th, 2015 Salesforce sent out another email stating the new certification test was now available, and with that, some additional information on the Developer paths. Salesforce would be offering a "transition exam" to people who currently held the Developer certification. The transition test would cost $100 ($50 for a retake), be 30 minutes, contain 20 questions, and have a passing score of 65%. To help folks prepare, as with all exams, Salesforce provided a App builder Study Guide, along with a new FAQ on the Salesforce App Builder transition process. Also as an interesting side note, the Developer exam is being retired and will no longer be offered after September 12, 2015. Unlike the old Consultant exam which was retired (summer 2011 I believe) when the Sales Cloud and Service Cloud certifications launched, Salesforce is currently stating: Existing Salesforce Certified Force.com Developers will continue to be recognized in the Salesforce Certification program and can maintain their credentials. What I haven’t been able to confirm is that if you take the transition exam, do you keep your Developer Certification? The last I checked, my Salesforce certification page shows that I now have both. So yes, I passed the transition exam on August 18th, 2015. The email I received had the certificate (below), but it stated that the new logo would not arrive until the end of September. If you don’t know how to check, see this blog post on how to verify your Salesforce certifications. I know most folks that find this page are probably looking for sample test questions for the Salesforce Certified App Builder exam. I can’t give you sample exam questions, but after taking the transition test I will provide you some additional study resources and pointers. First, start with the transition study guide. It has about a dozen links to great resources to help you prepare for the exam. Click and review the documentation on each of those links (types of sandboxes, managed vs unmanaged packages, etc)! The transition Study Guide does not give you the weighting of the exam objectives, however if you look at the Study Guide for the full exam, you can get that information as well. I think this is important for you to know as it gives you an idea of how many questions you might get in one particular area. For example, social features are listed as only being 3% of the exam, so I would think at most you’d only see one question. Be a smart test taker! Automation is obviously a big part of this certification. You might start your studying with this overview of Salesforce automation options, and then deep dive each option available (e.g. Approval, Workflow, Process Builder, Visual Workflow). Other thoughts? Well my friends, Salesforce has changed a lot since I earned my Developer certification back in May of 2009. In those days you didn’t have automation tools like Process Builder and you certainly couldn’t control the mobile experience. In my role today, I don’t get much hands-on configuration time to try out the new stuff. I have only used Lightning Connect once (on our own org) and my Salesforce 1 mobile configuration experience I can count on one hand, so I used the links in the Study Guide to brush up. Everything else I felt I had a pretty good handle on or lots of experience (I’ve worked in over a hundred orgs in the last ten years). I found the 20 questions on the transition exam to be fair and challenging and I used the full 30 minutes to review my answers before submitting the exam. Good luck!